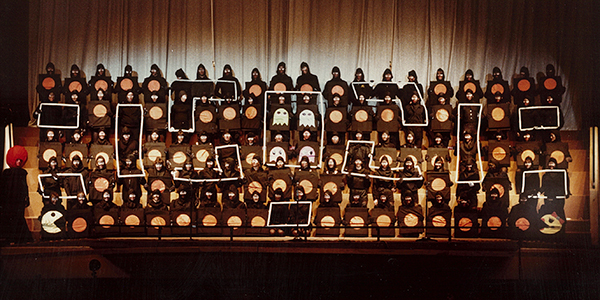 A Pac-Man theme for the freshman class of 1983 featured battery-powered Christmas lights to help animate their performance. Pac-Man, Princess Diana, MTV – the 1980s were all about shaping a new world for young people, and while culture change was rampant worldwide, a new force was making its mark on Sing Song at ACU: the Class of 1986. 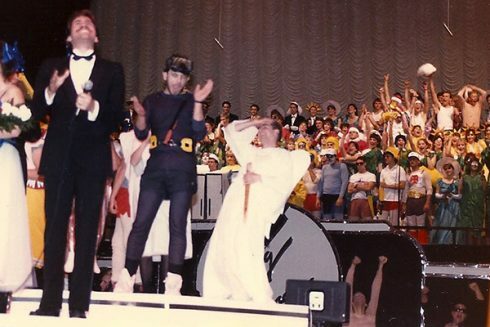 They lit up the Sing Song stage like never before as freshmen in 1983. That also was the first year Jeff Nelson (’79) served as director of Sing Song. Hunter (right) and others nearby react to news their senior class has achieved Sing Song’s first clean sweep – winning four straight years. Director Les Hunter (’86) and his class devised a Pac-Man video game theme, and on stage they used clear battery-powered Christmas lights in tubes to create elements reminiscent of the game screen. It was the first time a group incorporated on-stage lighting as a prop element. They also created flip-panel costumes so they could move boards up and down, contagion-style, and simulate video game movement. As a winning act, Pac Man set the stage for the class to repeat that win their sophomore, junior and senior years, with no ties. In the Sing Song mixed-voices competition, that’s called a clean sweep, and it was the first time in Sing Song history for a class to achieve it. The father of Les Hunter (right) is Sing Song’s founder: Dr. Robert D. “Bob” Hunter. Along with Pac-Man, themes for the class of 1986 included Mr. and Mrs. Potato Head (and their kids, the tater tots,) Lucy and Ricky Ricardo, and Adam and Eve. Along with the jokes, Roberts said, competitors started to develop characters and storylines with their acts. At that time, clubs and classes didn’t change costumes on stage, but they started switching and adding elements to enhance the stories, such as eyes and noses on potatoes and a large bandage on Adam’s side where a rib went missing. “The ’80s were all about costumes and songs,” he said. That held true with other groups, too. Notorious for not taking the concept of rehearsing too seriously, the men of Sub T-16 won the men’s division as Cabbage Patch dolls in 1984, complete with crepe paper wigs on their heads that, strangely enough, made them look a lot like the iconic toys. 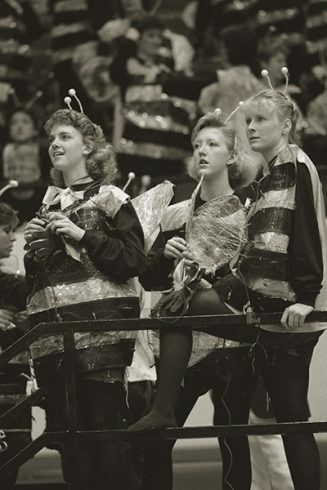 Sophomores in 1987 broke new ground with illuminated costumes as Broadway Bumblebees. 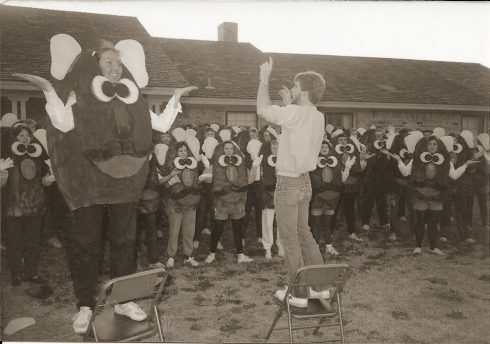 Then in 1987, the sophomore class pushed costuming to another level of creativity – integrating electric Christmas lights into their costumes as Broadway Bumblebees. Each costume contained a strand of string-along lights. Bumblebee Amy (Talbot ’89) McAlister explained that each participant plugged a strand of lights into the strand on the adjacent person; then extension cords ran from the stage down the stairs to an electrical outlet in the concourse. Another student connected and unplugged the cord to make the lights go on and off at the appropriate times. “Those were fun times,” McAlister said. I love the sophomore class at Abilene Christian University. A little birdie told me that you have produced a “We Love Lucy” entry for the ACU annual Sing Song benefit show, and I want you to know this redhead is rootin’ for you to wow the audience and take home the trophy. Nothing makes me happier than to know that Lucy and Ricky live on in the hearts of great kids like you. I wish I could be there to personally cheer you on. But I know that you will do your very best and make everyone proud. You can do it. Roberts said his classmates’ reaction was over the top. So was their performance. “It was truly magical,” he said. 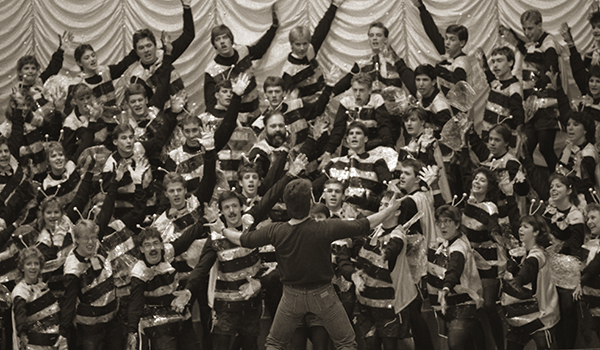 Hunter, Roberts and the Class of 1986 set new standards for Sing Song groups for years to come. Little did they know their creativity would become a gold standard in the production. The greatest thing, though, was how their efforts strengthened the bonds among their classmates. 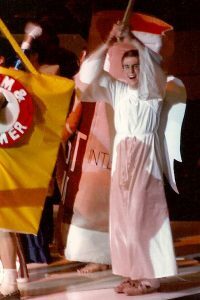 The seniors in 1986 won with their portrayal of Adam and Eve. Hunter leads his class of Potato Heads during a dress rehearsal. Kelly (’86) and Dodd (’86) Roberts work on Potato Head costumes. The electrically charged Broadway Bumblebees rocked Moody in 1987.